afrol News, 10 November - More than 1 million years ago, two competing ancestors to modern humanity lived in Africa. One of the upright hominid species however suddenly grew extinct. Researchers long attributed this to its diet, but new studies on skulls found in South Africa make it more likely that our direct ancestor, the early Homo, may have had an active role. South Africa's Swartkrans cave - famous among hominid fossil hunters - does not stop to surprise scientists for its rich database on our ancestors' history. 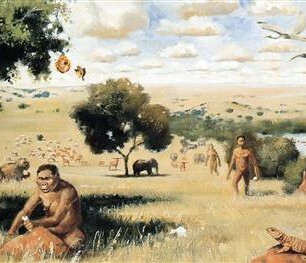 Swartkrans is a renowned early hominid cave site containing remains of several types of the earliest hominids, the creatures on the evolutionary road from apes to modern man. Among these hominids found in the Swartkrans cave are Paranthropus robustus and the earliest creatures of the genus Homo - which produced modern Homo sapiens. Both species walked on two legs across the woodlands and grassy plains of South Africa more than 2 million years ago. Roughly 2.5 million years ago, the australopithecines - which include the famous Ethiopian fossil Lucy - are thought to have split into the genus Homo and the genus Paranthropus, according to US anthropology Professor Matt Sponheimer. Paranthropus stood about 1.20 metres tall and probably weighed less than 50 kilograms, and its pelvis and leg structure indicate it was bipedal. "Although the brain to body-size ratio in Paranthropus robustus is slightly larger than that of chimpanzees, Paranthropus was not a mental giant," Mr Sponheimer notes. In a study - co-sponsored by South Africa's National Research Foundation and published in the current edition of 'Science' - the US anthropologist has looked into the poorly understood and much discussed sudden extinction of the Paranthropus as the African continent dried about one million years ago. Most theories relate its extinction to the creature's assumed picky eating habits and a deteriorating environment. The new study however shows that Paranthropus - often thought to be a "chewing machine" specialising in tough, low-quality vegetation - instead had a diverse diet ranging from fruits and nuts to sedges, grasses, seeds and perhaps even animals, said Mr Sponheimer. "The findings cast doubt on the idea that its extinction more than 1 million years ago was linked to its diet," he says. Using a technique called laser ablation to examine teeth from four individuals from Swartkrans, the scientists found that Paranthropus was often dramatically altering its diet over periods ranging from months to years. "This is the first study to paint a portrait of an early hominid eating its way across a varied landscape," Mr Sponheimer added. "None of us involved in the study dreamed Paranthropus would have had such a variable diet over thousands of years, much less in just a few months time." Mr Sponheimer speculated some Paranthropus individuals were moving back and forth between forested areas rich in fruits to a savannah and grassland landscape, perhaps along sedge-rich waterways. Since there also was evidence of year-to-year diet variation in the teeth, the team speculated the movements of Paranthropus may have been based to some degree on rainfall-related food variability, including the onset of droughts which can cause individuals to consume foods not normally preferred. While anthropologists are confident that the varied diet of early homo species - including meats and a wide variety of plant species - had helped to propel the line into a successful run on Earth that continues today, the notion that an overly specialised diet doomed Paranthropus to extinction in a changing environment is now in doubt, Mr Sponheimer said. So what ultimately led to the end of the line for Paranthropus? "It could well have been direct competition with Homo - which was becoming skilled in extensive bone and stone technology - or it could have been a variety of other issues, including a slower reproductive rate for Paranthropus than for Homo," he said, without being able to point to a clear conclusion. But South Africa's Swartkrans cave may provide more evidence for other researchers using other methods to shed light on the controversial question whether our ancestors started eradicating other species already one million years ago. The cave contains both bone and stone tools used by early hominids - including bone digging sticks thought to have been used to obtain termites or tubers - as well as one of the earliest known records of fire. The site contains animal bones burned at temperatures consistent with controlled fires. While the Paranthropus is not thought to have used any tools, the early Homos did not only have an ample diet, but also knew how to control fire and to make tools. Living side by side, the two species may have competed over the same resources. Obviously, the Homo genus went out of the competition victoriously, as has happened so many times thereafter.